Energy Transfer is one of the largest midstream companies in the United States, with operations in most of the major resource basins. The United States has been growing its production of energy and this has been benefiting the company through growing throughput volumes. The company is moving to take advantage of this by constructing new projects to increase its capacity. The Bakken region and Appalachian basins will be driving some near-term growth for the company. Energy Transfer trades at an appealing valuation relative to its peers and boasts a solid distribution yield. 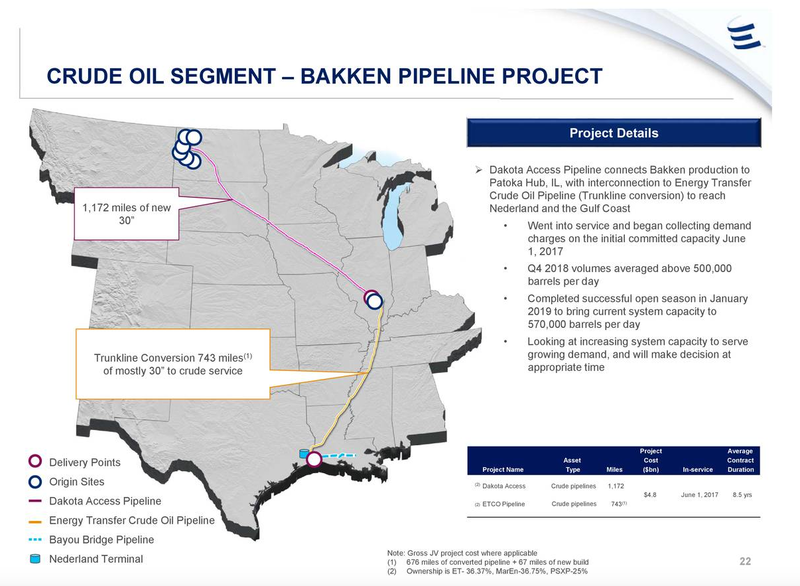 On March 27, 2019, midstream pipeline and terminals giant Energy Transfer (ET) released a new presentation to investors in the company. As is usually the case with presentations like this, the company devoted a great deal of effort to making an investment case in itself. Admittedly, there is a great case to be made for the company as it boasts a very high distribution yield and very strong growth prospects. The company also devoted some time towards discussing the various broader macroeconomic trends that are driving its growth potential. We will naturally discuss all of these things as we make a case for Energy Transfer. Overall though, the company does offer an exciting opportunity that investors would be wise to take advantage of. 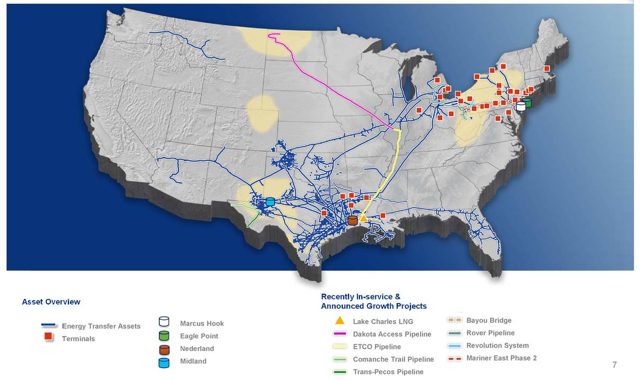 Energy Transfer is one of the largest midstream companies in the United States, boasting operations in most of the major basins in which energy resources are produced. One of the reasons for this likely has to do with the characteristics of the basin. The Permian basin is the largest petroleum-producing basin in the United States, boasting about five billion barrels of oil and nineteen trillion cubic feet of natural gas in proven reserves remaining. 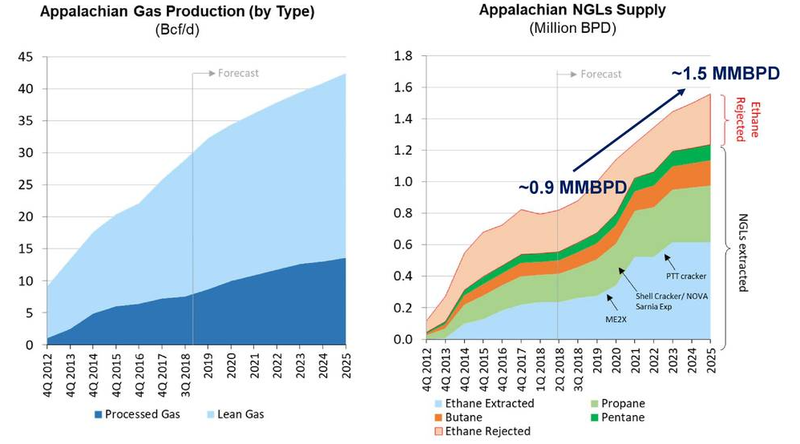 This is after already producing approximately 28.9 billion barrels of oil and 75 billion cubic feet of natural gas over the years. The vast majority (about 80%) of the remaining reserves are located at a depth of less than 10,000 feet, which makes the resources much less difficult to access than many other remaining resources in the world. The Marcus Hook facility is quite well situated to allow propane and ethane to be exported to both Europe and Asia, facilitating the nation's growing export industry as well as allowing energy producers to take advantage of the fact that pricing for the exported products may be better in those other markets. At this point, it is important to note that Energy Transfer does not actually produce any natural resources. The company merely moves oil, natural gas, and natural gas liquids from one place to another. Thus, the way that it benefits from growing production is that a higher level of production results in more resources needing to be moved. Since Energy Transfer's revenues are directly proportional to the amount of resources that it moves, a higher level of production results in higher revenues for the company. This should result in a greater amount of money making its way to the company's bottom-line. However, things such as oil and gas pipelines only have a finite capacity of how much resources they can carry. Therefore, in order to accommodate the increasing demand for resource transportation, it is necessary for Energy Transfer to add new pipelines (or expand the capacity of existing ones) to its infrastructure. It is doing just this on the Mariner East system in Pennsylvania. The first phase of this capacity upgrade was the construction of a second pipeline to run alongside the 70,000 barrel per day Mariner East 1 pipeline. This second pipeline, dubbed Mariner East 2, has a maximum capacity of 275,000 barrels per day and was placed into service in December 2018. The next phase of this expansion project is dubbed Mariner East 2x and involves the construction of new storage and terminalling facilities to better handle the larger quantity of resources coming into Marcus Hook from the larger pipeline. The nice thing about all of these infrastructure upgrade projects is that they are backed by long-term contracts that ensure that Energy Transfer will generate a positive return off of its investments in this project. As the Mariner East 2 pipeline came online in December, we should see the impact of it on the company's first quarter 2019 earnings results. A second project that Energy Transfer is working on is meant to take advantage of the growing oil production in the Bakken shale basin. This project is the Dakota Access pipeline, which consists of 1,172 miles of 30" pipeline going from the Bakken shale to Pakota Hub in Illinois. The first phase of this project went into service on June 1, 2017 and is currently transporting an average of 500,000 barrels of crude oil. In January of 2019, the company began soliciting its customers to see if it could expand the system's capacity to 570,000 barrels per day and have the extra incremental capacity get used. This solicitation was successful, but the company has not yet made a decision to proceed. If it should ultimately decide to, then we can expect this project to grow the company's revenue and EBITDA when it is complete. 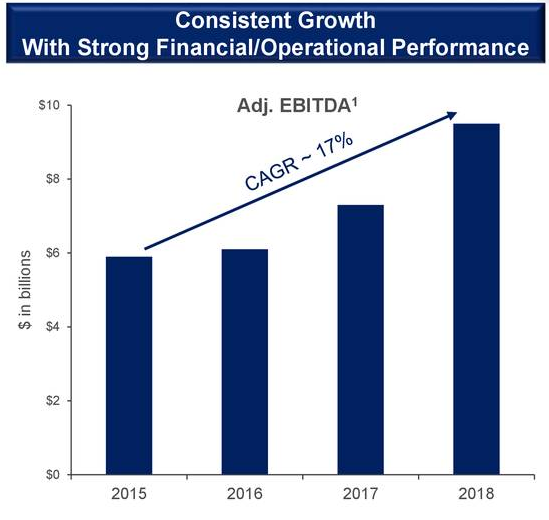 As we can see here, Energy Transfer has grown its adjusted EBITDA at a 17% compound annual growth rate over the 2015-2018 period. It is important to note that the period includes the terrible oil bear market of 2015 and 2016 that saw many energy companies, including midstream ones, run into trouble and either go bankrupt or end up having to change their business models. As such, the fact that Energy Transfer was able to persevere through this environment speaks well to the company's operations and its management. As we can clearly see here, Energy Transfer has the lowest valuation of many of its major midstream peers. As investors, we should generally show preference for lower valued companies since they will usually deliver superior returns going forward than higher valued companies all else being equal. Thus, the situation could be presenting us with an opportunity. The primary reason why investors purchase midstream companies like Energy Transfer is because of the sizable distribution yields that they typically boast. Energy Transfer does not disappoint here as the company currently has a forward distribution yield of 7.85%, which should certainly prove appealing for anybody looking for income. In conclusion, Energy Transfer is a major player in the midstream industry with operations in most of the major basins in which energy resources are produced. The fact that upstream customers have been growing their production in these basins presents the company with some growth opportunities that it is moving to take advantage of. 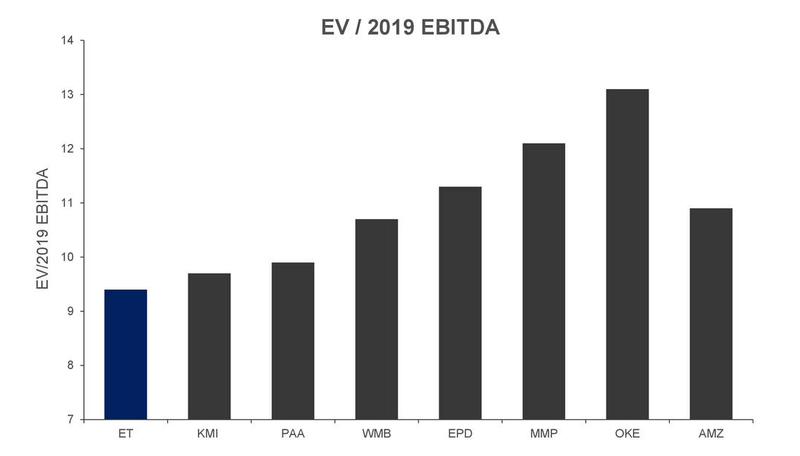 This should allow the company to continue its historic EBITDA growth and this combined with its low valuation and high distribution yield should make the company an appealing investment for most. At Energy Profits in Dividends, we seek to generate a 7%+ income yield by investing in a portfolio of energy stocks while minimizing our risk of principal loss. By subscribing, you will get access to our best ideas earlier than they are released to the general public (and many of them are not released at all) as well as far more in-depth research than we make available to everybody. We are currently offering a two-week free trial for the service, so check us out!